For 30 years professor Vadim Sidorovich follows lynxes and wolves in the Naliboki forest in Belarus. First as leader of the Vertebrate Predation Research Group of the Institute of Zoology of National Academy of Sciences of Belarus. Since 2014 he combines the research on lynxes and wolves with guided tours in the Naliboki forest. 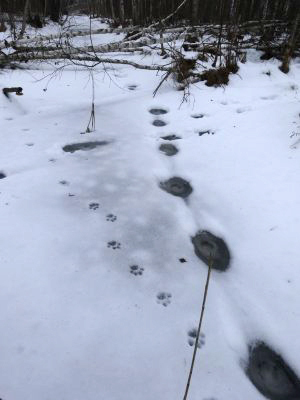 This winter you can join him snowtracking lynxes and wolves to find out how the animals use the terrain (hunting, cashing food, ranging, territorial marking, sheltering and resting). Another goal of the trip may checking the whole forest in order to find out how many wolves and lynxes are there, then map this information and see how the local population of species is organized. For this camera traps are used. According to the wishes of guests, the trip may be more or less specialized on one of the species, i.e. the wolf or lynx. Additionally, while doing this, you will face different species of  wildlife, for instance, bison, moose, beaver, otter, raccoon dog, white-tailed eagle, may be wolf, golden eagle. Visiting of broadleaved deciduous oldgrowth about three centuries old, wild river valleys and marshlands, will give you a sense of the primeval habitats of lynxes and wolves as it once was in many places in Europe. Additionally, in March-mid April, owls start calling and it is exciting to listen to different owl species. The great grey owl calls usually in daytime. Canis lupus, lynx, Lynx lynx, wolf. Bookmark.